how to hack gmail account with ease ? I guess gmail needs no introduction like what it is and how does it works. As it belongs to google, I guess everybody is aware of gmail email term. For those who are not aware with gmail. Its a email portal or service provided by google. As it belongs to such a great company hacking does become a bit difficult but don't worry we have bought some easy steps for your today. So today's main question is how to hack gmail account. When do you wanted to do this. This might be useful when you forgot your gmail account password or just consider a scenario where even "forgot password" option doesn't recover password for you. What will you do at that time ? Ofcourse you would like to hack gmail account at that time and this post is also useful for those who just wanted to learn hacking and wanted to improve there computer skills. Note : do not use this trick to hack other's account without permission. Please respect people's privacy. This article is for education and preventative use only. Gmail is product of google and it is one of the most secure service in the world. I hope you already know this thing right. So the only way to "hack" someone's gmail account is by stealing their password. But if that person has enabled "2 way authentication process" than hacking his/her gmail account is not possible until or unless you don't have his/her mobile device into your hand. There is no other way to break two-factor authentication. Today I'll show you 2 easy methods to hack someone's gmail account. You can select which ever you like. Both methods are easy and explained in step by step process below. So, lets start with the method 1. 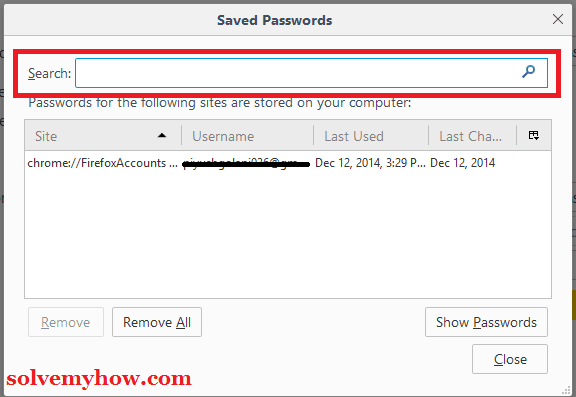 Method 1 :- Using Browser's Password Manager Method. Step 1 :- Borrow pc or laptop of your target for a while. To use this trick you must need his pc. Step 2 :- Open browser that your target uses usually. Now open the particular that browser only which your target uses to access his gmail account. In case if you're not sure about the browser then you can check all the browser's history. Step 3 :- Open password manager from browser settings. The way to access "password manager" from browser settings is varying from browser to browser. Click on gear button from the top or tools menu. Click on "content" tab >> "settings" button. Click on firefox menu button (☰) (extreme right and extreme top). Go to options >> security tab. Click on chrome menu button (☰) >> settings. Click on "show advanced settings" >> "passwords and forms" (scroll down a bit to find). Now click on "manage passwords". Click on safari menu >> preferences >> password tab. Step 4 :- Look for account.google.com from the list. You can use the search box to find faster. Just enter "google" in search box and it will display all google accounts. Step 5 :- Click on show password. Now simply select suitable target's google account from the list and click on either "show" or "Show password" button depending on browser. Step 6 :- Copy username and password. Now simple right click on username and password tab and click on copy username and copy password and make a note of it. Step 7 :- Simply try to login from another computer. Congrats now you have target's username as well as password. Now simply login from another machine. Note :- If targeted user has enabled 2 factor-authentication then you also need the "code" sended on his/her mobile phone while logging in gmail. That's it. Wasn't this was easy ? Do let me know in the comments below. Now lets see method 2. Method 2 : Using Keylogger Method. Keylogger is a software that captures user's keystrokes and email you that .txt file to your email id. Step 1 :- There are many famous keylogger software's are available. You can google below mentioned names and download whichever suits you the most. Some would email you the .txt log file or some allows you to take it from the pc manually. Step 2 :- Install suitable keylogger software into target's machine. Here you have to install keylogger software into target's pc or laptop. So you have to borrow his/her laptop or pc for a while and then quickly install the software. Step 3 :- Start keylogger service. Now you have to start/enable keylogger service from the target's machine. So it can start recording keystrokes pressed by user. Step 4 :- Look to the logs. When you enabled keylogger software it started capturing keystokes. Now it will either email you or you have to take the logs from the target's computer depending on software you have installed. So, that's why choose the software wisely. Now go through the full log file and find user's gmail account name and password. That's it. Congrats you just found target user's gmail username and password and now you can easily get in into his/her account. Wasn't this was easy too. So, this was all about how to hack gmail account into 10 minutes. Hope you found this tutorial informative and worth reading. If you're facing any difficulty in hacking gmail account please do let me know the problem in the comments below. You can connect with solvemyhow on facebook and you can also subscribe for solvemyhow newsletter to get pro hacking tips right into your inbox. As you can see I haven't kept any social content locker on this post as I don't want you to share this post forcefully but please share this post with your social media friends if you found this helpful. What is old mb. I didn't get you buddy. Please be specific. The procedure of hacking remain same for each and every account. a)If person is using igcognito window for chatting etc and delete the history etc after chatting on gmail/facebook, in that case can keylogger will be helpful? b)Keyloggers when downloaded will it not show on the system? e)If person opt, not to save password while opening his gmail or facebook, in this case how opening of chrome browser and check the (manage password). You've entered the recovery email id + mobile no. while creating your gmail account. You can use that email id now. Just go to forgot password and they will email you recovery password steps into your recovery email id. + you can also answer security question to get password back. Thanks for stopping by and commenting. Marya the above guide is capable of hacking any gmail account. Please read it and implement it. Thanks for stopping by and commenting. Friend this is the only procedure. You will get the details from the after searching for it. Then you simply have to copy and paste it. You may wanted to try it from another browser. P.S make sure the person is not using his/her account in incognito mode. Is there any other way to hack a gmail account??? I guess no. These are the only 2 possible methods. Hi, I only know the gmail address of the target user, but cant access the password. Will the keylogger target past key strokes from the computer? Thank you. Thanks for stopping by and commenting. Yes with keylogger tool you can get the targeted user password but it should be installed in his/her computer.